I sneaked a quick look at my Facebook profile this afternoon and the little bubble pictured on the left popped up ate the bottom of the page. You can now see who of your Facebook friends are online and chat with them realtime, instead of waiting for your wall to update. 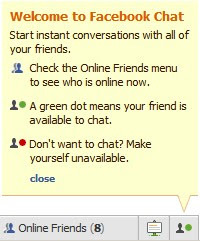 The implementation is very neat, although do I really want my 'friends' to know that I am logged into Facebook? aside from that i think the chat function is very cool. Now we ask what are the implications for applications like MSN and Addium?